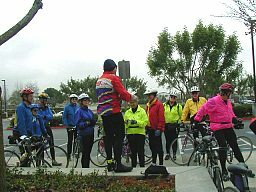 The backbone of the Almaden Cycle Touring Club is its club rides. But without people willing to be Ride Leaders, there would be no rides. Any Club member may lead a ride. If you sometimes feel that there is just not enough selection of rides at the pace that you want to do, then remember that there is one sure solution - LEAD SOME RIDES. There are no classes to take or hard-and-fast rules to follow. Our general ride guidelines are listed here. Below there are informal suggestions for listing and leading rides. The Ride Sign-up and Ride Description forms may be downloaded from this page. In addition, each Ride Leader should download the LAB Cover Letter and the Insurance Form and carry a copy of the Insurance Form on all rides in case there is an incident. A copy of the filled out form should be sent to Paul Vlasveld as he handles the Club Insurance. Ride descriptions are due 4 to 8 weeks ahead of time, to the Ride Scheduler. Use the ACTC Ride Description Form or submit by e-mail to rides@actc.org. The Ride Schedule Preview allows you to check your ride as it will appear in the Black & Blue Bottom and spot errors or submit changes before it goes to the publisher. There are many reasons for being a Ride Leader. First is that you know you will be riding where and when you want. In addition, you will be riding with your friends, making new friends, and adding to the range of rides offered to the Club members. There are many good roads to ride in this area as well as many destinations for camping, either self contained or supported by a SAG vehicle. If you don't know the area too well, then name the ride something like "Santa Cruz Explorer" or "Santa Cruz Ramble". That way it's OK if you all sometimes get lost. Try to think of a good ride title, one that will make people notice your ride and want to come do it. If you don't know the exact mileage, then list a higher number. Nobody complains if the ride turns out shorter, but they DO complain when the ride is longer than listed. Have an easy to find starting place, preferably someplace with available water and restrooms. And be sure that it is safe for people to leave their cars there for the day. Keep the ride descriptions brief but friendly. Feel sorry for the poor Ride Coordinator who has to type everything in. People don't need to know every little detail of the ride. Show up at the ride start location at least 15 minutes early. People should be ready to ride by the scheduled starting time, but give them at least an extra 5 minutes. But it is OK to remind them that they are late and to make sure it doesn't happen again. If, for any reason, you can't make it, find someone else to lead the ride for you. Have a ride sign-up sheet, and make sure that everyone prints their name legibly. Make sure that any non-members also sign their name in the bottom section. Mail the ride sheet to the Club Statistician, or bring it to the General meeting if it is only a couple of days away. If it is possible to get lost on the ride, then you should provide maps. Make sure that any new riders have a map and know how to use it and what the general route is. If the ride is going to be long, have scheduled water and food stops. Plan on 10 to 15 miles between these stops, but also have scheduled regroups to make sure that nobody gets lost and that the slower riders have a chance to catch up with the faster riders. Regroups are at the tops of every long hill, plus at junctions where the correct turn may not be obvious. If your group is large then assign a capable rider to act as 'sweep', one who knows the route you will be taking and can help any rider who may develop a problem on the ride. Remember: the ride is not over until all riders have returned to the start location or have been accounted for. Insurance forms need to be carried by each ride leader and used to report accidents on rides. Contact the Ride Coordinator if you have any questions. What Terrain and Pace ?